The family pram has migrated to the cellar, to the hidden depths of the building where unwanted objects go to die. In the old buildings built with bomb-proof shelters for all, spaces were provided to store family essentials, in case the Apocalypse, or the Soviets, didn’t leave them time to shop. When the bombs fall over Switzerland, people all across the country will no doubt have orgies of wine and müesli, find their forgotten objects, old skis, broken cuckoo-clocks and ill-fitting clothes and wonder why on earth they kept them. Now, with changing fears and shifting threats, we use these to keep our unwanted junk. The pram has now gone there to rest: Mr A has decided he no longer needs an afternoon nap after school. Time is passing. To spin it out a bit more, I threw in some more rhubarb and then brown sugar, randomly, pragmatically. It gave it a lovely rich dark red colour. I let it boil and boil, but I have the sneaky feeling it won’t set and will have to be rebranded as “Strawberry Coulis”. This sounds fancy, and better than Well-it-would-be-jam-if-Mama-had-followed-a-proper-recipe. My lovely mother-in-law was probably out gardening in the Spring sun, because my SOS phone call to her at 5pm for her jam-making secrets just rang and rang. 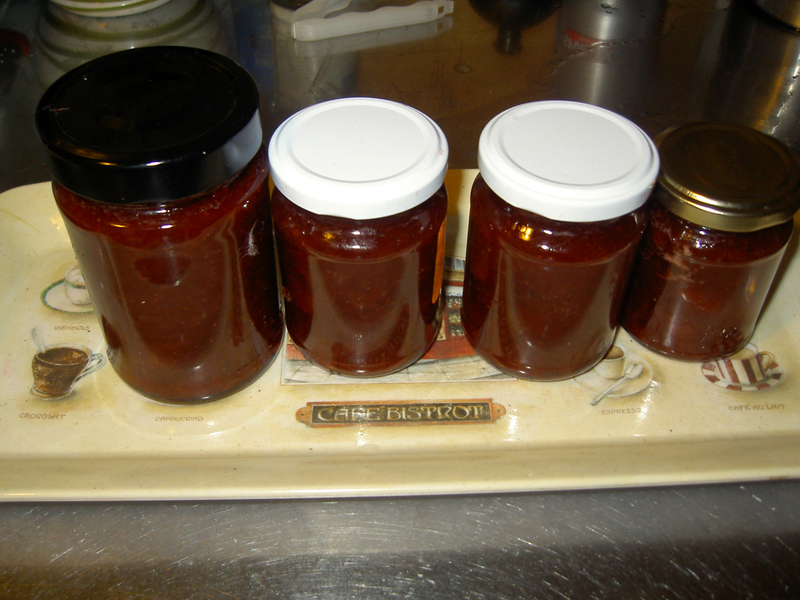 But then is it surprising that I cannot make proper jam when there is already a Jam Queen in the family, with her own bomb-proof cellar full of the stuff, in every taste and flavour imaginable, and often made from wild-picked fruit? Before the jam set, we spread the still-liquid first batch over heart-shaped scones. We called it “Strawberry compote” at that point, rescued from the overflowing pan, but little Mr A wasn’t convinced. It looked distinctly dodgy to him, sloshy. He wasn’t convinced about the scones either. Clearly the wrong shape. Could I tell him it was because Mama couldn’t find the round biscuit-cutters? Miss R thought they were lovely. Always a tactful lass. visiting from really random thursday. Wow I have never lived where there is a bomb proof shelter. Things certainly do change. The law on bomb shelters was left over from the Cold War. The law has now changed, and new Swiss buildings are no longer required to have shelters. But, when I was a kid, there was the threat of inspections if your shelter didn’t have basic supplies of oil, flour, sugar and water. My parents had theirs full of marmalade and wine, and the odd Christmas pudding, like most people… I used to think it was daft to waste space of making these, but when I did research in Bosnia Herzegovina in the 1990s, I remember thinking that lives would have been saved if they had had such places in their towns. Sad times.